We have found that by including many in-house wedding services and products in our packages we can consistently host weddings that exceed the expectation of our couples and their families. Every aspect of our wedding packages are formulated and designed to produce beautiful weddings every time! Our catering is done in house. We shop and hand pick the food for your menu and prepare it fresh in our kitchen the day of your wedding. The bridal floral will be custom designed, delivered fresh from our wholesaler and put together on site in our flower room. Our DJ is a professional wedding DJ. He has been trained specifically to facilitate and DJ your ceremony and reception music. He also serves as the MC. If you don’t want rose bouquets or want mixed bouquets we can customize your floral. There will be an up charge for premium flowers used in bouquets. 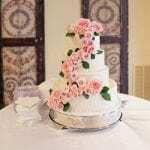 A tiered wedding cake with butter cream icing for the size of your guest count. Beautiful wood pedestal table with a silver cake stand. Cutting of the wedding and groom's cake (grooms cake not included). 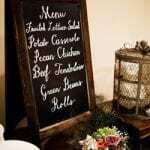 A full service catered buffet reception with 5 servers per 100 guests. We set up the reception areas and provide tables, chairs and floor length white linens. We provide a set table with chargers, silverware and napkins. We provide china plates and glasses served from our buffet stations. We provide beautiful centerpieces on the guest tables – our signature floral arrangements and candles on mirrors. We provide a sweetheart table for the bride and groom. We provide setup and decoration of the food buffets using beautiful overlays, candles and other tasteful accents. Complete cleanup of facility after reception. All selections will be served with green beans and rolls. Iced tea, lemonade, ice water and coffee are served in tasteful containers. An alcohol package may be purchased for the wedding reception. See below for pricing. Our reception food is freshly prepared and delicious! 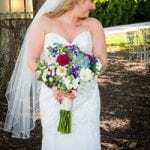 Our Rose Hall DJ is a professional, seasoned wedding DJ. His service includes equipment for the ceremony and reception. He will play your requested selections, make introductions, play requests and facilitate reception along with wedding director. MUSIC DIRECTORY - We have provided a tool that will help you create a wedding playlist specific to your taste! He can accommodate any music requests even it does not appear in the directory. A wedding venue close to the communities of Acworth, Kennesaw, Cartersville, Woodstock, Douglasville, Dallas and Hiram, Georgia.